The saga continues with my master bathroom makeover. This room was part of my 30-Day Room Makeover Challenge. If you remember, it was extended to 40 days because my readers and I needed more time. But I “failed” my own challenge because I didn’t get done by the due date. I tried to chuck up the delay to the new floor being installed on Day 28. The real reason for the delay in getting my bathroom done is because I’m scared of messing up. You see, one thing I absolutely love is pushing myself further than I’ve ever gone before. So I decided I would go outside of my DIY comfort zone and build a 60″ bathroom vanity. Let’s keep in mind, folks, that I’ve hardly ever built anything bigger than a breadbox. HA! The last update I provided, I had shown you how I planned to upcycle these old legs from the salvage shop into vanity legs. I knew they’d be perfect, even though I didn’t know exactly how I would use or attach them. I hate stripping and sanding curved surfaces! LOL. 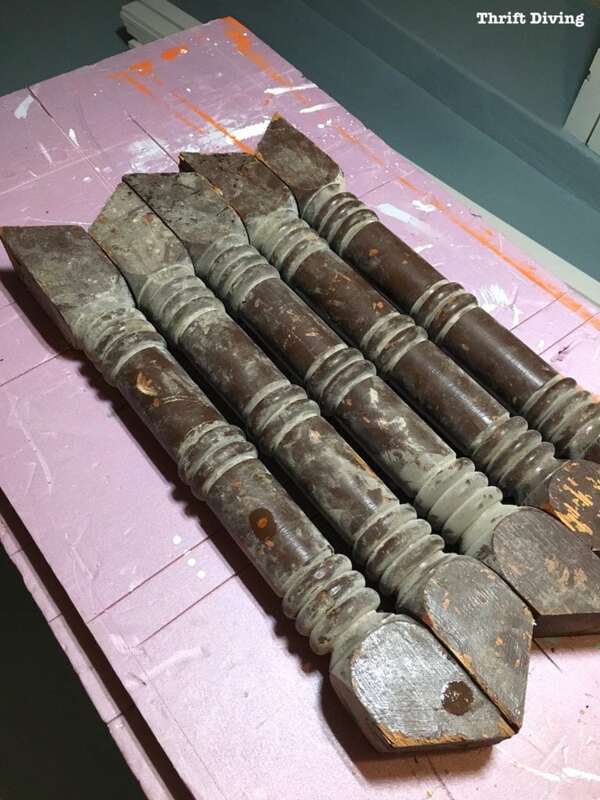 Once clean, they were ready to be used to start designing and building my DIY bathroom vanity! It won’t be anatomically correct. I’ll get halfway through and realize I screwed something up and have to start all over. It will look good initially but it will crack under the weight of sinks, granite, or climbing kids. Did I mention I am afraid it will crack….? It’s different if you’re building a vanity from DIY plans that someone has already painstakingly crafted for you. But when you’re using upcycled legs, there are no plans for that. So I promise I’ll share more detailed step-by-steps, but for now, here’s where I am with things! If you recall above, those vanity legs were the only thing I started with. 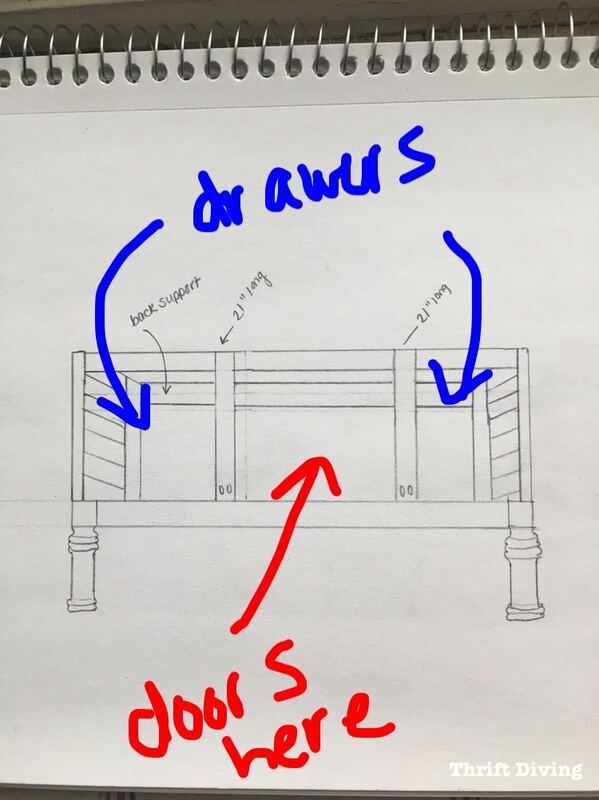 But after buying some solid oak, I started sketching what I thought it would look like. I didn’t know how to create this in SketchUp, an easy way to draw in 3D which a lot of builders use to plan and create projects. But it would have taken me just as long to learn how to draw it in 3D as it did to build it! Sometimes you got to go old school, yo! I can’t wait to explain to you how I’ve done it so far! This week I am hoping to be done. Just got to get the drawers built and inserted, along with making some cabinet doors. The granite should be ready by the end of the week! 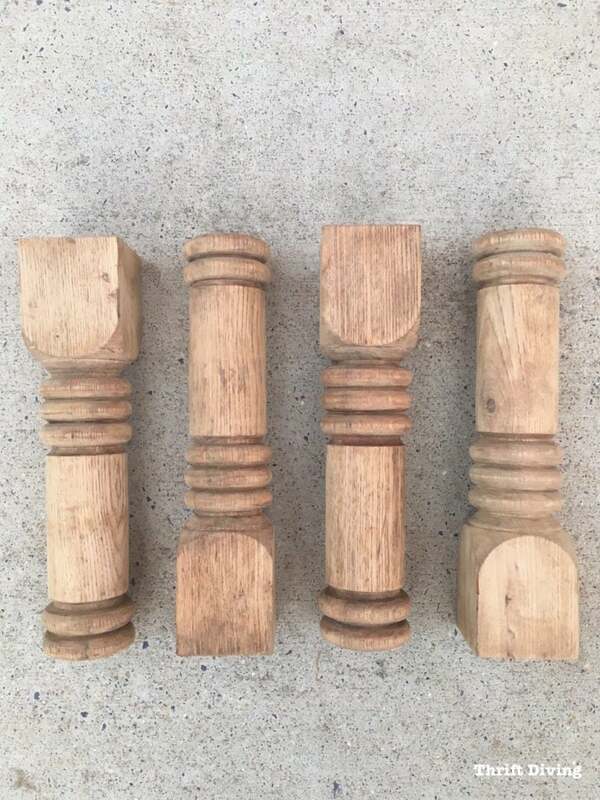 In case you’re wondering if I am going to stain or paint it, I’m going to be painting it, but with a very light wash of gray, following by liming wax which will settle into the grain and highlight the grain. It’s a technique I learned at an Amy Howard painting workshop and I have always wanted to do a piece in that manner. I plan to practice on sample boards first so I don’t ruin this piece! 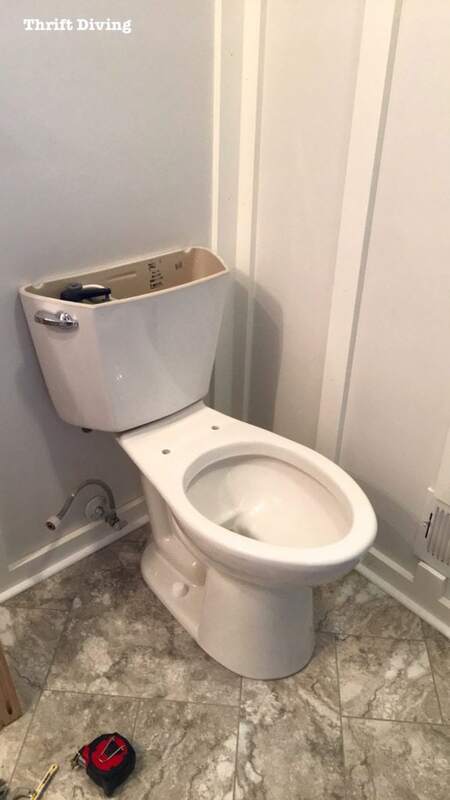 I ran into issues such as whether there was enough room for the plumbing. 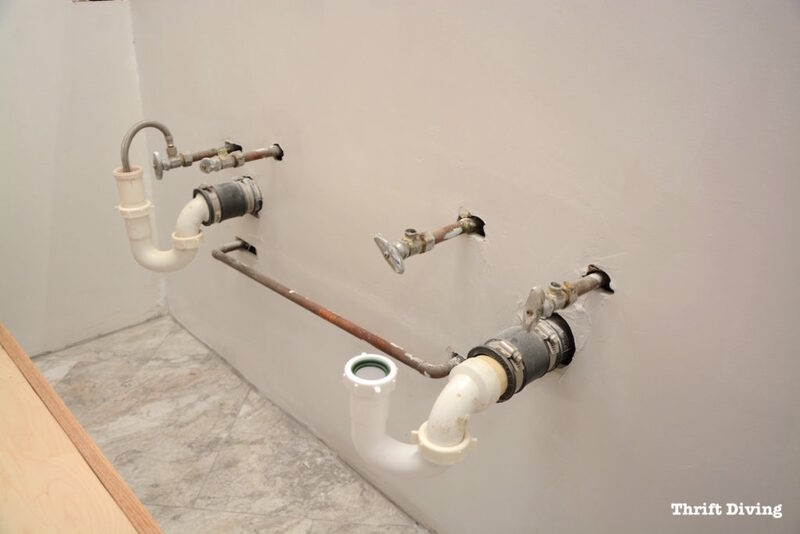 My friend Edmundo said there should be at least 6″-8″ of space under the pipes to work, but I’m sorry–in taller vanities like this, how can that be possible unless the plumbing is super high on the wall? My thought is this: as long as the cabinet doors in the middle swing open, there should be plenty of room to do basic plumbing. Anything more extensive would need the vanity removed from the wall, anyway, right? 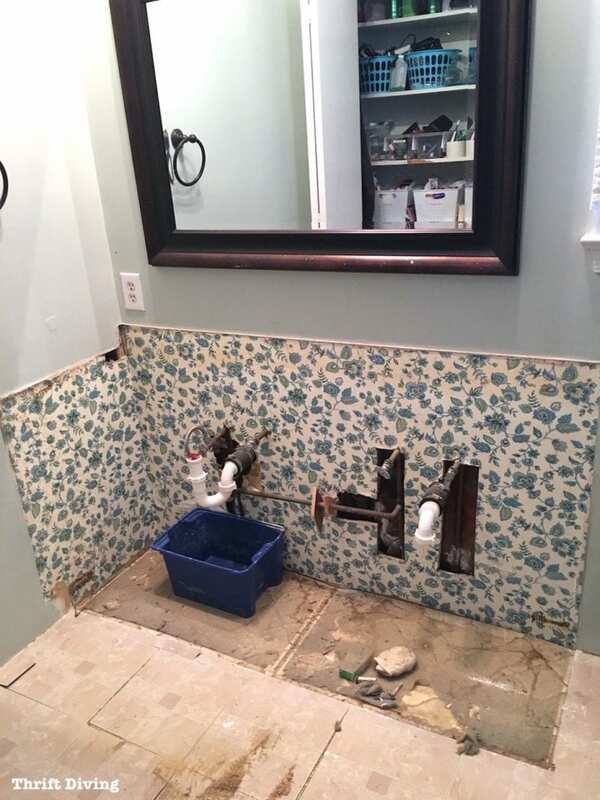 Remember those nasty, ugly holes behind my vanity, where the plumbing must have been updated years ago, but the holes never filled? Once the wallpaper was removed and some paint added, it looked better. I was actually going to take the lazy route and not repair these big drywall holes, but it wasn’t a good idea to do that because of pests, humidity, and other things. Plus, when I open my pretty vanity cabinet doors, do I really want to see gaping holes?? It was challenging as heck to drywall around plumbing!! It was even harder to apply drywall mud and sand smooth around the plumbing, so some areas are little rough. But considering it’s going to be behind a vanity, it does the job! I’ll share this tutorial on how to fix and repair big drywall holes with you soon! 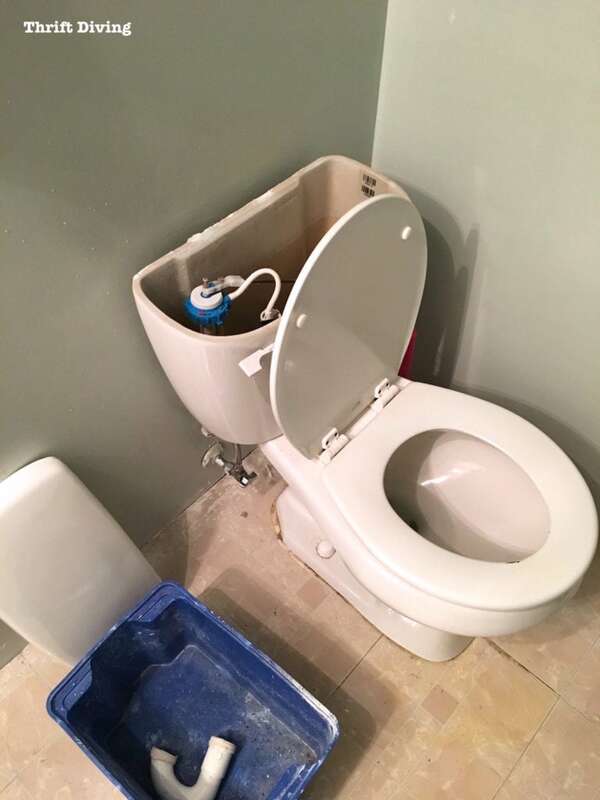 Since I had removed the toilet in my kids’ bathroom makeover previously, this toilet was a cinch to remove and replace! I’ll be sharing this tutorial with you, as well! So I’m only giving you a sneak peek of the new Mansfield toilet I installed. I’ll give you the full tutorial soon on how to remove and install your own toilet. It’s actually very easy! My goal is to finish up this project by Friday. I haven’t forgotten about you guys! I’ve just been in the throws of a challenging (yet exciting!) bathroom room makeover and trying to figure out how to build a DIY bathroom vanity from scratch! In the meantime, have you checked out all the other room makeovers from readers in the makeover challenge? You can see them here! I’ll be back on Wednesday with another update! Catch up on this entire master bathroom makeover series! DAY 4: Picking Out New Flooring: Which One Do You Like? Interesting article Thank you sharing it. Awesome job my friend! Can’t wait to see the finished project. It’s scary and challenging to take on a project so large. Clearly you’re up for the challenge! Kudos for a job well doe! Hey, Lindia! Great tip. So far, it’s coming along. Still not done! Each step that I think will take 1 day, takes 3, due to “LIFE” getting in the way, plus my drive to do it right the first time, correcting mistakes as I go along. It’s been fun!! Serena Appiah, Carpenter. You need to have new business cards made. Your project is most impressive, and I can’t wait to see the finished project. In fact, yours is the first email I open when it comes in. They are always great. I’ll share a little tip I learned from my father. Instead of putting expanding foam in those holes around the plumbing, which breaks down over time, shove some fine steel wool in there. Keeps the bugs out. Thanks for the tip about the fine steel wool. I actually just bought some yesterday and will do that before the vanity is fully installed! 🙂 Thanks!!! You got this girl! 🙂 Wishing you lots of luck finishing it. I can’t wait to see how it all comes together. Fantastic job!! I’m always excited to see an update from you. 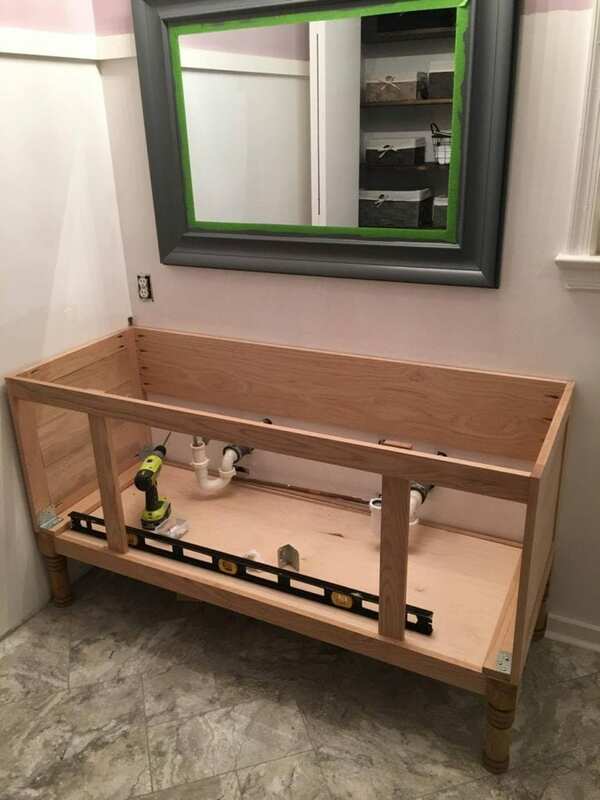 😀 The vanity plan looks awesome, you did a great job coming up with that – your DIY skills are growing by the hour!! 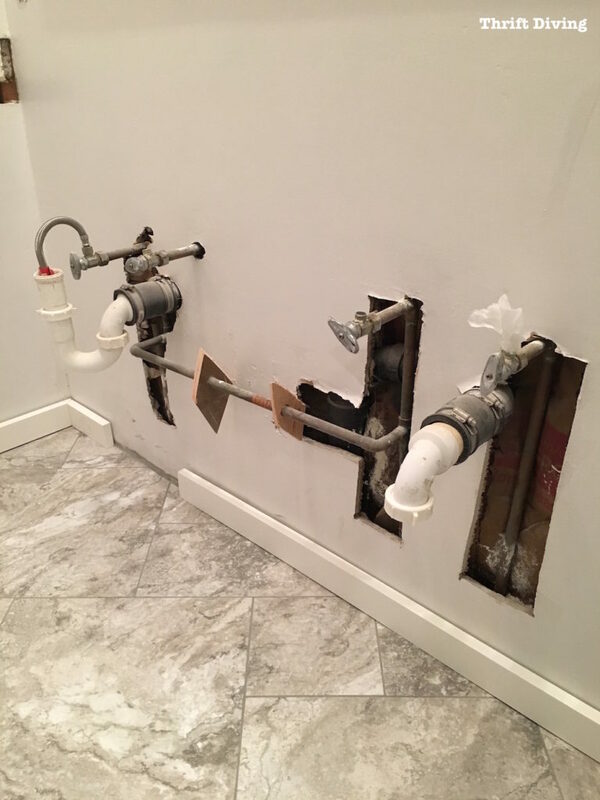 WOW, how did you fill in the dry wall around the gaping plumbing pipes? What a girl!! You are my heroine. You have so much ambition and drive. It is going to look spectacular! I have faith in you! Nice. Really nice. I feel your fear. (Haven’t we all been there?) So glad you are sticking with it. There really is one rule to DIY: the rules change all the time. Oh, in case you missed it, the rest of us are just trying to get through the holidays. You decided to so this bathroom NOW? Oh, and you have a husband, three kids, and a house and extended family, plus your own life. Wow. I got all my presents mailed before the post office deadline. I was feeling good before. lol Have a wonderful time with everyone this season. Looking forward to more posts next year. I had to laugh at your comment, Elizabeth! LOL. I know–why did I decide to do this NOW?! I guess because…maybe I’m just crazy?? Plus, DIY *is* my life! I could do it every day, all day, because I love it so much. And holiday time is perfect since most people are focused on traveling, spending time with family, they’re not worried about reading DIY home blog while everyone is talking about holiday stuff, right? 🙂 Perfect time for me to escape to my bathroom and get lost in the project, and hopefully come out a victor by the time everyone comes back to the real world! 🙂 Anyhow, hope you had a great holiday and that you’ve got big plans for the New Year!